The Treasury Department explained its measures in a five-page document sent to Congress with Lew’s letter. In it, the department specifically ruled out other alternatives — like selling off government assets to stay under the debt limit. “Selling the nation’s gold to meet payment obligations would undercut confidence in the United States both here and abroad, and would be extremely destabilizing to the world financial system,” the Treasury Department said. Also ruled out: Selling the remainder of Treasury stock in institutions bailed out during the financial crisis, or selling its portfolio of student loans. Some quick research found that the United States holds more gold than any other nation in the world by a wide margin, with a total of 8,134 tons of the shiny yellow metal deposited in vaults in places like Fort Knox and deep under the New York branch of the Federal Reserve. 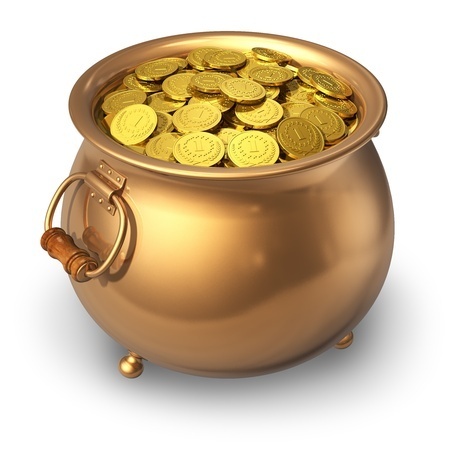 All that gold ever does is sit in its vaults – it is not and has never been used for any productive purpose since coming into the grasp of the U.S. government. But what if the Treasury Secretary had a change of heart and instead chose to use that gold to strike some 5,205,760,000 half-ounce coins with it, which the Treasury could sell to the public, just like it did in the decades before President Franklin D. Roosevelt issued Executive Order 6102 in 1933 to seize gold coinage and bars from the public? Some of those old half-ounce coins are still in the public’s hands, where their prices have recently been recorded within a range of $614.50 to $657.34 per coin. At that range of valuations, the total value of the U.S. government’s entire gold hoard would be anywhere from $3,198,939,520,000 (just under $3.2 trillion) to $3,421,954,278,400 (or just over $3.4 trillion). That would provide quite a lot of breathing room under the nation’s statutory debt limit, and frankly, only a fraction of it would even be needed. Curiously, if the U.S. government were to mint such coins with the same face value of $25 as it did previously, the U.S. government’s gold hoard would be worth just $130,144,000,000 (a little over $130 billion). But that doesn’t answer the question, Why does the U.S. government even need all that gold? After all, the only thing it does with it is stick in it all in underground vaults — much like Smaug, the evil gold-hoarding dragon from J.R.R. Tolkien’s The Hobbit . That’s when everybody found out why he hadn’t been more sociable: The dour, white-haired recluse had been hoarding $7 million worth of gold coins, most of them hidden in the crawl space beneath the house. Some were in an old washing machine. There were British sovereigns dating back to the 1840s, Austrian ducats, and South African Kruggerands. But mostly Samaszko had collected rolls and rolls of $20 American gold pieces, the kind with double eagles on them. He also had $12,000 in cash, a stock account worth $165,000—and $200 in the bank…. Samaszko’s methods for protecting his golden hoard pretty much match the methods used by the U.S. government. There really must be something about having so much gold that turns some people into such crazy hoarders that they are absolutely unwilling to make rational decisions about how to use it in the real world. Like selling a portion of it to pay down their bills when their credit cards are maxed out.